My report with the Wilson Center’s Mexico Institute has just been released. It draws on archival research on the NAFTA negotiations, particularly using new documents from Mexican archives, and asks what the negotiations and their context can tell us about North America today. “Two decades ago, Canada, Mexico, and the United States created a continental economy. The road to integration from the signing of the North American Free Trade Agreement has not been a smooth one. Along the way, Mexico lived through a currency crisis, a democratic transition, and the rising challenge of Asian manufacturing. Canada stayed united despite surging Quebecois nationalism during the 1990s; since then, it has seen dramatic economic changes with the explosion of hydrocarbon production and a much stronger currency. The United States saw a stock-market bust, the shock of 9/11, and the near-collapse of its financial system. 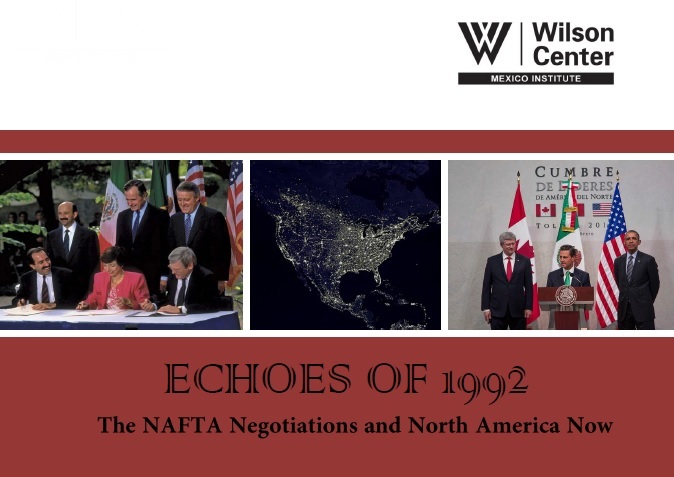 All of these events have transformed the relationships that emerged after NAFTA entered into force in 1994. By tsl2m5 in Uncategorized on December 19, 2014 .